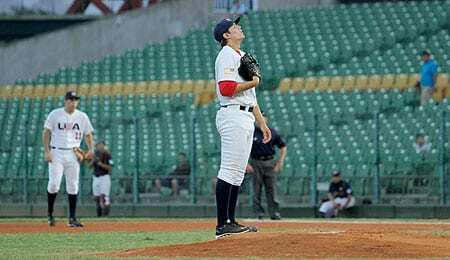 Our 2014 MLB Draft coverage takes us to Brady Aiken, the (almost) consensus No. 1 overall pick. The 17-year-old left-hander from Cathedral Catholic High School in San Diego is generating plenty of buzz despite the fact that high school pitchers don’t often reach the pinnacle of the draft. With Aiken, age is just a number, or at least we hope so. He could become the first prep pitcher taken first overall since Brien Taylor in 1991 (remember how well that worked out? ), and he has the physical skills we love. A 6’4”, 205-pound lefty with a fastball that can reach the high 90s would excite anyone, but it’s his polished skill set that really sets Aiken apart. (You can get a sense of that in the video below.) Because he is just 17, he will get plenty of time to develop no matter where he lands, another major plus for the team fortunate enough to get him. If the experts are all on point, Aiken will be calling Houston home sooner rather than later, and it’s unlikely he will fall beyond the White Sox at No. 3. The concern over prep pitchers going high in the draft isn’t likely to deter teams from drafting the southpaw, and Law, Baseball America’s John Manuel, MLB.com, and MyMLBDraft.com all have Aiken going to the Astros in their mocks. Forgive us for not making any drastic proclamations, but we concur with the experts that Aiken is the alpha dog of the 2014 draft. Carlos Rodon comes highly touted but seems more likely destined for Miami or Chicago, and the Astros aren’t going to reach for Alex Jackson, so it’s hard to envision them going in any other direction but Aiken. We name-dropped Cole Hamels in our Jackson profile, interestingly enough, so it’s fitting that Aiken has been compared to Hamels in terms of his pitching polish. Aiken projects as a dependable front-of-the-rotation starter with ace potential, but will have all the time he needs to get there. Now it’s your turn. Let us know in the comments below where you think Aiken will wind up and what we can ultimately expect from him. Crave more in-depth Fantasy analysis? Then join us every Thursday at 9 p.m. EST for RotoRob Fantasy Baseball Weekly Podcast on Blogtalkradio as we entertain and edify you for an hour or more each week. This week, RotoRob will again be joined by MLB Writer Michael Seff. Tune in here. This entry was posted on Tuesday, June 3rd, 2014 at 11:18 pm	and is filed under BASEBALL, Draft report, Michael Seff, Prospects, Scouting Report. You can follow any responses to this entry through the RSS 2.0 feed. Both comments and pings are currently closed.